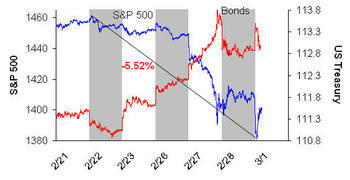 Well after seven days of weakness, the market has now put in a 5% correction (on an intra-day basis). Will this be enough, as has been the case through the entire bull market, or are we finally in the middle of the market's first ten percent correction of this bull market. Only time will tell. Note though, how the S&P 500 did test its lows (actually some could argue that it failed to hold) from Tuesday, before bouncing. I think the market is holding onto hope that interest rate still remains favorable. However, it is possible that with rates still at historic lows there may not be enough stimulus. Just a thought.